Please read this blog, Sudan Watch, in its entirety and - most importantly - in sequence, from the beginning. It is unique as it was published live, in real time, as news and events in Sudan unfolded and has become an important resource. There is nothing else like it in the world. Some of the reports and photos captured can no longer be found elsewhere online. To date, Sudan Watch has received 358,681 visits and 530,614 page views. Monthly visitor numbers remain consistently the same, even after postings ceased in September of last year. Very few visitors arrive at the site by mistake. Over the past four years, the Site Meter for Sudan Watch showed that the most important postings and photos were viewed by many thousands of people working at the highest level. Daily visitors are from governments, military, top universities and organisations from around the world, including Sudan, China, Russia, Iran, India. Please ensure that you are as well informed as they are. Also, see yesterday's excellent editorial by Jonathan Steele (copied here below incase the Guardian moves its archive) and note the concluding line, quote: "The list of practical problems that would flow from an indictment of Sudan's president is long. It far outweighs the benefits. The ICC's prosecutor should think again." Thank you ICC, here's wishing you the very best. During the past week, I have read hundreds of online comments by various people such as human rights activists, Sudanese rebels and their supporters. They are all praising the ICC and applauding Mr Moreno-Ocampo, encouraging him to keep up his good work. I sure admire his great courage and style. Peace and good luck to you all. Ingrid. The International Criminal Court's prosecutor appears to be on the verge of a fateful decision: whether to issue an indictment against Sudan's president Omar al-Bashir for his alleged activities in Darfur. The indictment, if it comes as expected on Monday, still has to be upheld by an ICC tribunal. The next stage would be for the Security Council to decide what action to take to implement an arrest warrant. Even if vetoed, as it probably would be by either Russia or China or both, the existence of an ICC arrest warrant in itself would make it hard for Bashir to travel abroad. Perhaps more importantly, it would put huge pressure on officials of foreign governments to stop their contacts with Sudan's president, and by extension, with the Sudanese government. Even though everyone is innocent until proved guilty, it would be odd for governments to deal with a man and a regime that have been put under such a conspicuous cloud of suspicion. Who would benefit from this? Almost no one. The conflict in Darfur is too complex and the attempts to resolve it are too delicate for so one-sided and blunt an approach. The two previous cases where incumbent presidents were indicted by international courts (though not the ICC) were very different from Sudan. The Yugoslav president, Slobodan Milosevic, was under military attack from Nato. Negotiations had been cut off. Ultimately, they were renewed but only with the good offices of the Russians who had shown no enthusiasm for the Hague tribunal's indictment. Charles Taylor, the Liberian president, was indicted by a special hybrid court for his activities across the border in Sierra Leone and at a time when the two countries were virtually at war. The conflict in Darfur is essentially an internal issue with multiple facets, involving the government and various rebel groups, as well as criss-crossing tribal disputes. Atrocities have been committed on all sides. The degree of blame, the extent of the killing and the number of victims are hotly disputed. A hybrid African Union and United Nations peacekeeping force is in place. Although Bashir and his government have put up a range of obstructions to make it hard for them to deploy quickly and operate effectively, UN member governments are also at fault for failing to supply the men and equipment that they pledged. Hundreds of UN and non-governmental agencies are on the ground providing food, water and other aid to the camps for the thousands of displaced victims of violence. The situation on the ground is dire. Hijackings of aid vehicles and food, mainly done by rebel groups, are increasing, with the number of incidents for the first six months of 2008 already equal to the total for the whole of last year. The aid agencies have to work with the consent of the government. Short of a hostile invasion designed to topple the regime in Khartoum – a decision that would be foolish and sure to make the situation even worse – there is no other choice for them but to deal with Bashir and his people. As for the chance of finding a political solution to the Darfur crisis, the AU and UN are conducting fitful talks with Darfur's rebels in the hope of getting them to resume negotiations with the government. How could the mediators expect to persuade the rebels to be reasonable if the other side's president has been charged with war crimes? Nor is Darfur the only seat of tension in Sudan. The peace deal between north and south, which ended a conflict that went on longer than Darfur's, is still fragile. What would happen to the coalition government that currently runs Sudan in preparation for a referendum on the south's potential secession? Could the Sudanese People's Liberation Movement remain in government with a party whose leader has been indicted? What of the road map for the disputed province of Abyei under which UN troops now patrol an area where there was high tension earlier this year? Would UNMIS have to freeze its contacts with Bashir? The conflict between justice and pragmatism is never easy to resolve. Holding people to account for their actions is a desirable goal, but it has to be weighed against the difficulties it creates if the indictees still hold power. Bashir is not Pinochet, who was long out of office as well as out of favour in Chile when he was indicted (by a foreign judge, not by an international court). The list of practical problems that would flow from an indictment of Sudan's president is long. It far outweighs the benefits. The ICC's prosecutor should think again. "While advocates and human rights groups focused on Darfur may applaud reports of Sudan’s President, Omar Bashir, being indicted by the International Criminal Court, they should think again about their enthusiasm. The question all of us must ask who care about what happens to the long suffering Sudanese people is this: what are the peaceful options for a way out of the crisis facing the country and what measures are likely to move the country closer to that way out rather than further away? Without a political settlement Sudan may go the way of Somalia, pre-genocide Rwanda, or the Democratic Republic of the Congo: a real potential for widespread atrocities and bloodshed as those in power seek to keep it at any cost because of the alternatives. An indictment of Bashir will make it much more difficult for any country or international organization to help negotiate a political settlement with the Sudanese government. Some forms of pressure may force the Sudanese government to negotiate a political settlement, some will only make their leaders more intransigent: an indictment is clearly in the later category. The regime will now avoid any compromise or anything that would weaken their already weakened position because if they are forced from office they face trials before the ICC. Free and fair elections are now much less likely, if they ever happen. They are much more likely to be rigged or if Bashir’s party looses them they will refuse to comply with the results just as Mugabe has in Zimbabwe. This indictment may well shut off the last remaining hope for a peaceful settlement for the country." International Criminal Court presents evidence of crimes across Sudan's Darfur region and may name new suspects for prosecution. News conference begins 1100GMT. Mia Farrow's opinion piece entitled "China is Sudan's protector and enabler" (Huffington Post Friday July 11, 2008) reveals that China is preparing to introduce a UN resolution to suspend ICC jurisdiction over Sudan, and that the Chinese backed UN resolution proposes stripping the ICC of its power to investigate or prosecute Sudanese authorities for 12 months. I say, how clever, diplomatic and ingenuous of the Chinese. China and Sudan seem good for each other? China is overpopulated and Sudan needs all the help it can get, while the Russians quietly sneak and snoop around the world, staking their flag into the Arctic seabed. Surely, with all of its advanced communications and technology, Russia is the one to watch. The world, as always, is a dangerous place. History never stands still. The haves are surging ahead of the have nots in a fast moving Information Age where the unthinkable is yet to happen. The Cold War is far from being over. Read full report by BBC Correspondent Hilary Andersson at BBC News online Sunday July 13, 2008. Photograph of Nanchang A-5 Fanta fighters in Sudan captured by a UN observer July 2007 at Nyala airport in Southern Darfur (Felhangardetj.blogspot.com) via Sudan Tribune. Source: Sudan Tribune article published Sunday 13 July, 2998 07:00 entitled "China violated the arms embargo on Sudan - BBC report" Excerpt: July 12, 2008 (LONDON) – The Chinese government is providing training and equipments that are used by the Sudanese government in Darfur, the British Broadcasting Corporation (BBC) revealed in an in-depth report to be aired on Monday. Fragmentation of groups and factionalization constitutes a serious impediment to the peace process as it greatly multiplies the number of potential interlocutors with differing, and often unclear and ill-formulated, agendas. Perhaps the Sudanese government is against UN peacekeepers in Darfur incase they help hunt down war crimes suspects for the International Criminal Court? Message to hackers and terrorists at this site. Sudan Watch blog is powered by Blogger.com (owned by Google) so the archives are stored in databases in the USA, not in my computer. Sudan Watch photos are stored in Flickr's database, not in my blog or computer. Since I rarely email or use phone, there is nothing more to mess up there either. So bug off. Or risk being arrested for terrorism. I am not joking. Someone mighty scary is watching out for you at this blog. Note to self. Many links in this blog point to articles at the Paris based Sudan Tribune. Last year, after Sudan Watch and my computer were hacked, most of the links pointed to one Sudan Tribune report. None of my doing. I had post excerpts, so no damage. The eye opener was not being able to post at Sudan Watch for a few weeks during a critical time. The blog vanished from search engine listings, including Google. And for a short time reappeared as a blank page entitled "Time is running out..." Thanks to the Blogger Team for restoring it ok. During those weeks of mayhem, I caught sight of some text left behind in the wake of broken links (one was The Black Book) appear similar to Chinese, Japanese, Korean. Here's saying a big warm hello and apology to all those who have emailed me and never received a reply; and my blogmates (special hi to werner, drima and scary) missed you, sorry I've spent so much time offline. Still losing dates of incoming mail. Maybe one day, I'll tell half the story of what befell me last year; the other half, I'll take to my grave. Shiver. This blog almost cost me my life. These days I am recovering from ten bereavements (including my mother) Feb-Mar-April this year. Good news is, my health is improving. Bad news is, my beloved 5-year old PowerBook is getting battle weary from my thousands of postings on Sudan, Uganda, Congo, Ethiopia and Niger. Hey Dear God Steve Jobs, I sure could use a complimentary new PowerBook backup with large screen to help stop squinting burning eyeballs and pain flaring in left thumb from scrolling! Sorry this post is way too long. It has taken hours to put together. Plan was to resume blogging September 21. 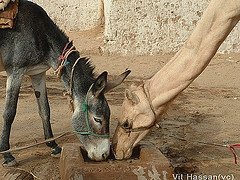 But the latest news on Sudan compelled me to stick my head above the parapet (again!) Please don't shoot the messenger! Future posts here are likely to feature peacekeepers killed in Sudan and any news of the perpetrators. Contributions of info, obituaries and photos are invited. If you have suggestions or writings on any of the above issues, please do let me know, even if it is just a few words or link in the comments here. My email address is in the sidebar but please understand I am not always able to reply. Thanks. Bye for now. Ingrid. "In Sudan unusual friendships often develop." Here is a good example of why things are not always the way they seem. Iran attempted to deceive the world with last week's high-profile weapons test by claiming that a 10-year-old missile was a new, longer-range version capable of striking Israel, US intelligence officials and independent analysts believe. Analysis of Iranian television coverage has also indicated that one of the weapons actually remained on the ground but the video was doctored in an effort to cover up the failure. Read full report by Philip Sherwell in New York and Carolynne Wheeler in Jerusalem, at telegraph.co.uk Saturday July 12, 2008.